We are not pulling out until Tuesday but thought I would let you know that we have been busy. Joanie saw her doctor and had to have some more tests that turned out OK.
We have visited our storage locker (a few times) and traded out some stuff we did not need for stuff we believe we will need as winter approaches. Joanie wanted her canning stuff, knitting and sewing stuff, I wanted my painting supplies, some new books to read and we exchanged some summer clothes for winter ones including Joanie's boots and jackets, hats and scarves for both of us. This, of course, required the general reorganization of almost all our storage compartments and there is no one better for that job than the Organization Queen herself, Joanie, DW. I helped. voila! the rotten egg smell was gone from this campground's water. The water is now decent and drinkable. However, Joanie bought 2.5 gallon jugs of spring water from the grocery store that we will continue to use for drinking. 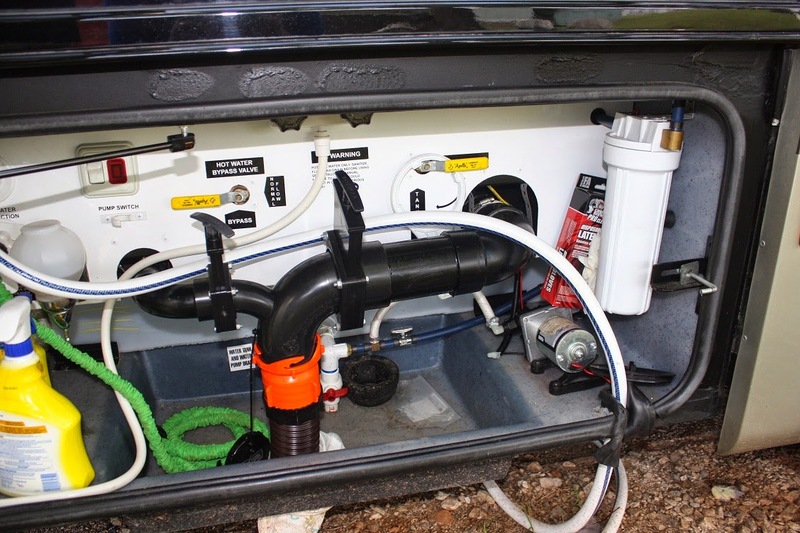 A lot of full time RVers do that as a matter of course, never consuming water from their fresh water tank. We drink "city" water in campgrounds if we deem it OK. This is the inside of the "wet bay". The water filter is the white cylindrical device in the upper right corner. While we were parked here in Lake Wylie, we also helped some old friends with things. This included, among others, helping Joan and Boots, who own a Tiffin Allegro Bus and are almost "full timers", with some fix ups around their stick and brick and with their coach. Boots needed to replace the chassis batteries which went south real fast last week. That's usually the way with batteries - one minute they are behaving as they should and the next, they are worthless. One day his coach started up fine - the next the batteries showed only 7.4 volts after a constant charge. Turn the key and "nada". 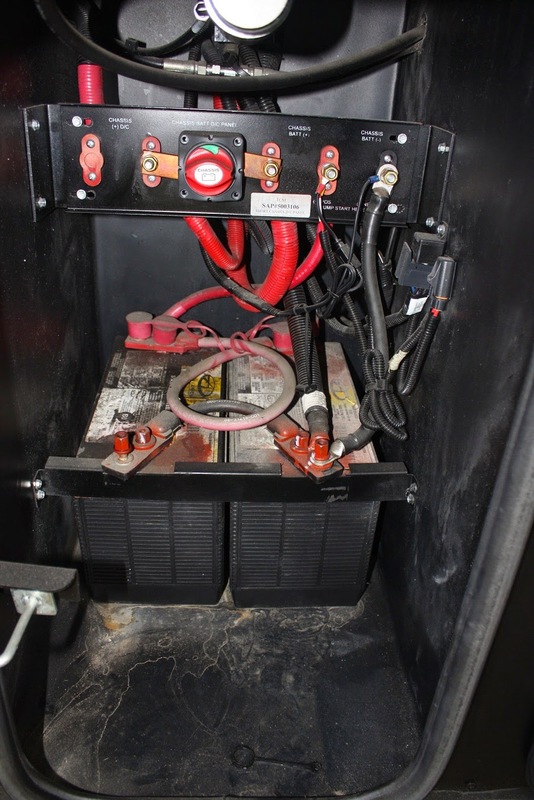 Motorhomes have a back up plan - when the chassis batteries die, with the flick of a switch you can tie in the 12 volt "house" system in case of an emergency like this. It's like getting a jump from yourself. This is my chassis battery compartment. I have pictured it here just to give you a visual of the size of the batteries required to light up big diesel engines. Freightliner puts two 12 volt, 1000 cold cranking amp batteries on their chassis. Tiffin adds 4 six volt batteries wired to make a 12 volt system to run the coach electrics for a grand total of 6 not-so-small, not-so-light-weight batteries. I went with Boots to have the new batteries installed just to further my education. The owner of the automotive repair shop where we had the chassis batteries replaced showed off his "love" he had parked out front. It was pristine! I also helped Boots with the repair of a small accident he had that damaged his tow electric cable. This required some crawling around under the front of their Saturn and trying to figure out the correct wiring on the plug that runs from the back of the coach to the toad. We thought we got that corrected but could only get the right turn signal to work. After a lot of head scratching, we finally started to look at fuses. Viola! Another education moment. Joan and Boots are on the road today. Godspeed. I am not allowed to help organize the "basement" of the Fifthwheel . That's sure ok with me. Leonard knows just how he wants things. Thinking he needs to get down there and get busy. I think they call it "division of labor". There are some people in the world to whom God gave the gift of Organization. To the rest of us, we still are looking for the gift. I have been reading your blog for a few months. Not sure how I found it, but it is on my daily list. Finally connected that your "Boots and Joan" are the same couple who are officers in the Tiffin Travelers. I've run into Boots a couple of times, the last being at an FMCA rally in Perry. He spotted me out in the crowds! I also saw a post with your blog reference on TRVN, so now I know you post there! I decided to do this comment after I saw that you have not implemented Cruisingator's modification on your wet bay dump piping after viewing a picture in this post. It is the flat bar piece that supports the valve manifold to prevent breaking the outlet from the tanks. If you want more information, contact me. Richard and Patsy, nice to meet you. I was at the Perry rally and remember it well for all the rain and it was the first time we had dry camped for more than one day. Piece of cake. I'm not big on making mods - I guess it is my new "retirement attitude". I have not made the wet bay mod because I had not noticed it being a problem on TRVN. As an engineer, do you think that the gray and black pipe connections are a hazard? On my coach, when I would rotate the dump fitting to dump out of the bottom of the "well", there was significant movement on the header which was transferred to the tank connections. Another poster recently asked about how to repair these outlets because his were leaking. Yes, I think it is a real problem. I made it as soon as I saw the mod posted by Ted. Thanks, Richard. 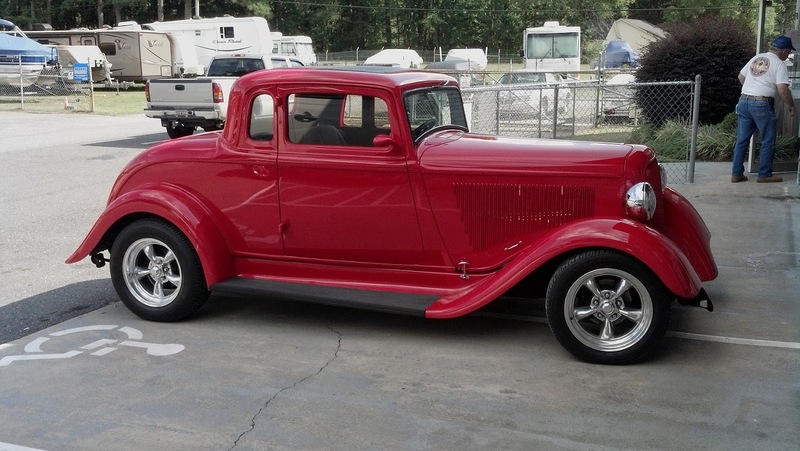 As soon as we are parked long enough to get at my tools, I will do this mod (probably about second week of October).